I use a Babylock Jane, with the janome ruler toe. The shank is the one specifically for the 1600p. Works like a charm. I'm in love with ruler work! I use a Babylock Jane machine, similar to the Janome 1600. My machine came with a free motion foot that I don't like. It's a basic foot, flat and oval in shape with a flat, clear plastic center, which I removed. I am looking for a round FMQ foot. Since I already use the Janome quarter inch piecing foot with guide I wondered if parts of the convertible foot set would also work on my machine. I contacted a local Janome dealer last week about buying the set but he's not returned my call, as yet. Read Siobhan's comment and see that you can use the ruler toe! Yay! Purchased mine over the weekend...Oh my what an improvement!! Thank you. I'm going to buy one of these rulers to try on my Bernina using the darning foot (unmodified). It is certainly possible to do ruler work without a special toe. It's trickier since the ruler can slip over or under the foot. Go slowly and give it a try. I don't have any of the Janome ruler feet. I did purchase a couple of the rulers from Accents and have been using them with my regular Viking free motion foot. I make it work though I know a thicker foot would certainly be better. I'm hoping there is someone out there that's used the Janome feet with a Viking and that will make me think more seriously about ordering the ruler feet. When I quilt on my Bernina, I just use my plain jane darning foot. I haven't tried it with any rulers yet. Maybe someday! Ha! Love ingenious quilters! I too modified a cheap aftermarket foot! Nothing like having that extra 100 bucks to spend on fabric! I use the 1600P version on my Husqvarna Viking Mega Quilter - love it! I'm fairly new at all things sewing and I quilt with a Brother. I'm still learning so much and I'm practicing as much as I'm able to with FMQ and your blog gives me hope I will get better. I could definitely use anything that will help me on my journey! Thanks so much! I have been following along but haven't tried this yet. But I am very interested. I have a Viking and am not sure if a ruler foot is made for my machine or if I could use a different manufacturers foot. Would love a post on what is available to use on different brands. The Accents in Design rulers do not work with unmodified Bernina feet because the little grippy strip raises the ruler off of the surface just enough to allow a foot to slip under if not held just right. If I use the Angel rulers, modifying the foot becomes unnecessary. There is no slippage at all and I was successful with them my first time out. They really do rock. I did enjoy Sandy's comment above about her easy modification of her #9 foot-clever! 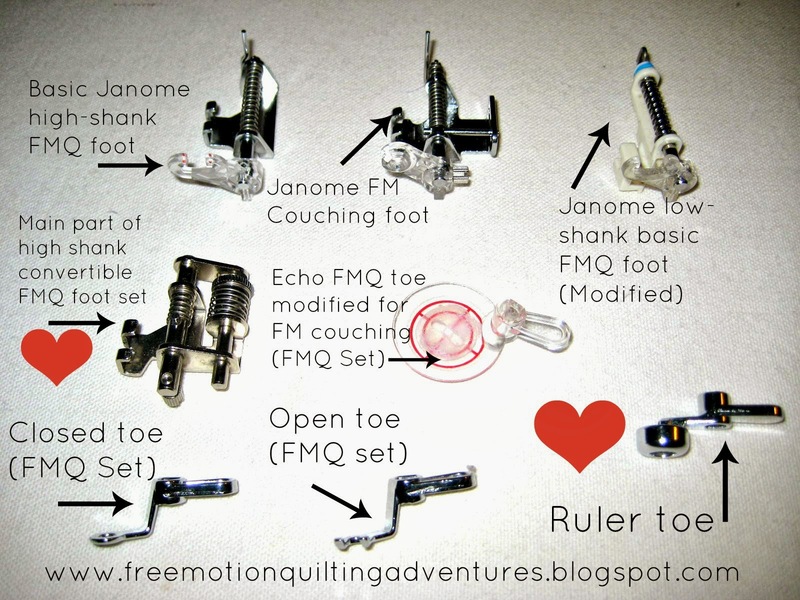 I would love to use a ruler foot on my low-shank Pfaff is one of these Janome feet specifically low shank? I already own quite the collection of rulers since I used to longarm quilt until I learned how to FMQ on my Pfaff and discovered I am much better with that technique. Oops! Read the blog before the coffee was done brewing. Thanks for including the part number. This will be ordered! I haven't purchased one yet either due to the fact I don't know if it will work on my Mega Quilter. It will be great to have a list of which brands will work with each foot. Thanks! Carole- are you referring to the Viking Mega Quilter? We have folks here who use the Janome 1600P version of the Convertible Free Motion Foot set with the ruler toe with no problems. Carole, the mega quilter and the Janome 1600P are identical machines....manufactured under the brand name Pfaff as well. This speaks volumes about how awesome this machine is! As I recall, there is a forth manufacturers as well but I can't remember whom that is. ZJanome makes all of the models and slaps a different brand name on it. Jake, you are correct. The other brand is Brother. The model # is the Brother 1500S. Though that doesn't mean that other Brothers are compatible. Thanks for joining in the conversation! I quilt with a Juki 2010T and after much searching found Finishing Touches Quilt Shop in West Virginia that will modify your Juki free motion foot with a ruler toe or sell you a new foot that has been modified. I have used this ruler toe foot with the Accents in Design rulers and have been really pleased with the results. The only problem that I found is that the needle must be up to fully raise the modified foot. Thank you for all your wonderful videos on using rulers and on free motion designs. I just checked out Finishing Touches Quilt Shop website that Jane mentions above. They will adapt your Juki foot with a ruler toe for $35.00 plus $5.50 shipping. If you want more information, go to: http://www.finishingtouchesquiltingstudio.com/documents/1Voyager%20ruler%20foot.pdf. Quite interesting information and pictures. I'm back again. Same company has a video on adjusting your hopping foot ruler toe. http://www.finishingtouchesquiltingstudio.com/apps/videos/videos/show/17893356-hopping-ruler-foot-adjustment. I did get the free motion foot that you have I also have the same sewing machine! Love it! I have been play with it, but still having some trouble moving the ruler and fabric! Thanks for a chance to win! I have the high shank model and I use it on my Pfaff Grand Hobby Quilter. Works like a charm. I have a Bernina and haven't tried ruler work yet but I've been carefully reading your blog and the comments above and they have inspired me to try one of the adaptations for the Bernina!! Thanks!! I'm lucky and have the Janome Horizon 7700 so the ruler toe works great with the tow accent rulers I've ordered. I am in practice mode too. I use the foot on my Janome Horizon 8900 and was told by my dealer that it would not work just like you said he would say. I assured him it would and bought it. I have been wanting to try these new rulers you have shown and would love to win one. I have a similar issue with the "accufeed system" on my Janome 6600. I just received my ruler foot for my Janome 7700 and can't wait to try it. I still need to order my set of rulers. My Janome Dealer also didn't think this foot would fit my machine. I'm glad that you clarified this on your Blog. Amy, I am glad that you post your tutorial and give us all your advice. Many Thanks!!!! I modified my regular open toe (for my 1600P) out in my machine shop by making it thicker and of course, it works just fine. I didn't even know they made one for my z1600P, but thanks for the info. I do not use rulers often, but when I need straight lines I do. I have a Janome 1600P and bought the ruler foot..only to find out there were 2 parts to it. Now I need to order again. Is this correct? I have also bought several rulers from Accents. This is why I call it the ruler toe--- it fits on one of 3 versions of the Convertible Free Motion Foot sets. Can't use the toe without the foot. If I can mail it to a US address, I think that qualifies! Just realized if I started watching your videos now, instead of in the fall like I planned, I could have answered my own question! What I've heard from Babylock folks so far is that the needle position doesn't line up well with the convertible foot set and ruler toe. That being said, if you can get your needle in what seems to be a usable position, try lowering the foot more to see if that helps with the tension. The quilt can "flag" up the needle if the foot is too high, causing tension issues. Keep me updated. Feel free to use my email on the about page to contact me directly as you are a no-reply blogger, so I can't return your email/comment directly. "Hi my quilting friends, I free motion quilt on a Pfaff 2027. I purchased the low shank Janome foot set several weeks ago but had not used the ruler foot until today. My DH modified the foot by filing a notch for the IDT mechanism behind the Pfaff needle bar. With that done the needle is now neatly centered in the ruler foot and all works well. The IDT still impedes the ruler at certain angles,but with practice, this could become addicting. Thank you for all your wonderful instruction Amy, and all the friendly visiting from the rest of you! "